A couple of new tasting spoons found their way into my shopping cart the other day so I was looking for something to fill them with. Wanting a touch of protein in my one-bite appetizer, I turned to smoked salmon for a nice light texture. Mango is an easy pairing with salmon and a great winter fruit. Avocado mousse offered just the right backdrop for both. Place a bit of each in a spoon, add a sprinkling of chopped green onion or sesame seeds over the top and watch your guest hover over your tray as you present these delightful amuse bouches. The truth is that anything can made small and placed into little spoons, you just need to be creative with it. 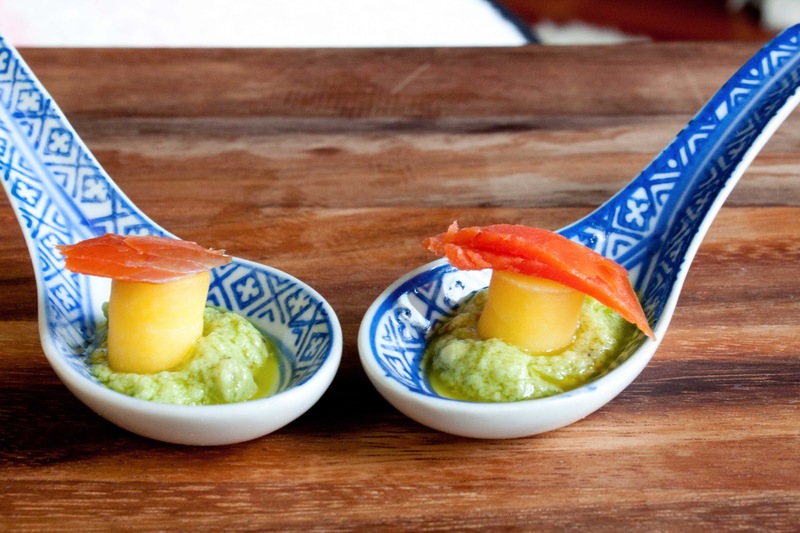 These easy Fat and Happy Smoked Salmon on Avocado Mousse Appetizers are a great place to start. I'm co-habitating with a geek. He tries to hide it from time to time, but he is a little boy at heart. Week-long, themed birthday celebrations are the norm in our house and this year was no different. Not sure why it took me so many years to actually do 'Geek Week' for my love, but it was a smashing success. From Zombie Insurance to Light Saber Popsicles, each day brought a new present and more fun and they all led up to the grand finale: a homemade R2D2 Replica Birthday Cake. Creating this Star Wars cake takes time and some patience but it's completely worth it. 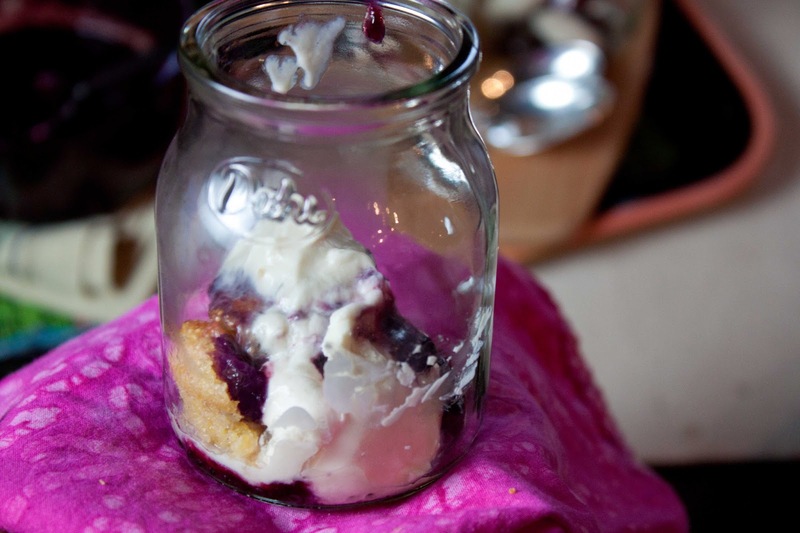 Bake the cakes ahead of time and freeze them so you can focus on the most important part - decorating. This isn't the time to test out new cake recipes; save yourself a lot of hassle and go with tried and true. The cake is comprised of six layers: 1 chocolate stout bunt cake, 3 layers of buttermilk white cake, 1 layer of Rice Krispies and 1 layer of Chex Mix Krispies along with two extra pans of rice krispies for the arms and legs, four batches of buttercream frosting and four recipes of homemade fondant. The fondant keeps everything so moist and delicious- this cake lasts days of noshing. It's a big, giant, heavy, delectable cake. 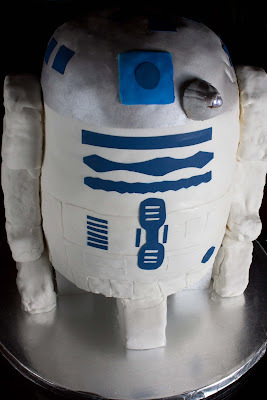 Wow your birthday guy/girl with this R2D2 cake, then deliberate for hours whether you should actually cut into the cake, eventually enjoy a piece out of the back side, then let him take it to work and blow everyone away. The kudos will have you flying high for a week. Young or old, pocket protector or not, all fans of Star Wars deserve a Fat and Happy R2D2 Cake at some point. The only real questions is how to out-do this next year?? I'm in charge of appetizers for an afternoon birthday party for a good friend of mine. It's the dead of winter but a heavy app doesn't sound appealing (especially when chicken is the main entree.) I wanted to make something interesting without being too fussy. Elegant by not stuffy. Classic over molecular. Pasta salad was running through my thoughts... but individual appetizers tend to be easier for guest to pick up and enjoy in standing party situations so portability is key. Taking the pasta out of the salad and using it as a mini bowl did the trick. 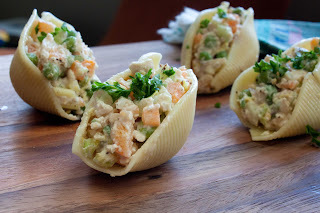 Jumbo shells, cooked just al dente, filled with a zippy lemon pea salad is a clever way to serve pasta salad as an appetizer.